Why did certain domestic murders fire the Victorian imagination? 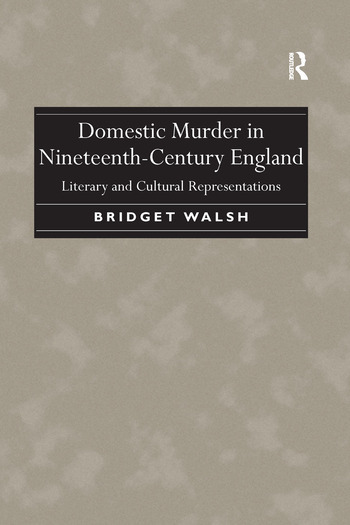 In her analysis of literary and cultural representations of this phenomenon across genres, Bridget Walsh traces how the perception of the domestic murderer changed across the nineteenth century and suggests ways in which the public appetite for such crimes was representative of wider social concerns. She argues that the portrayal of domestic murder did not signal a consensus of opinion regarding the domestic space, but rather reflected significant discontent with the cultural and social codes of behaviour circulating in society, particularly around issues of gender and class. Examining novels, trial transcripts, medico-legal documents, broadsides, criminal and scientific writing, illustration and, notably, Victorian melodrama, Walsh focuses on the relationship between the domestic sphere, so central to Victorian values, and the desecration of that space by the act of murder. Her book encompasses the gendered representation of domestic murder for both men and women as it tackles crucial questions related to Victorian ideas of nationhood, national health, political and social inequality, newspaper coverage of murder, unstable and contested models of masculinity and the ambivalent portrayal of the female domestic murderer at the fin de siècle. Bridget Walsh teaches English at Hills Road Sixth Form College, Cambridge, UK.